Blurb: In The Gatekeeper's Sons, Therese and Thanatos, the god of death, met and fell in love. In The Gatekeeper's Challenge, they did everything they could to be together, even break an oath on the River Styx. But the Olympians don't tolerate oath-breakers. Ely’s Review: Usually when it comes to sequels, I get a little hesitant about reading them because they are almost never as good as their original. I immensely enjoyed the first two books of the Gatekeeper’s Saga, and so I began to worry that maybe this book wouldn’t live up to those standards? However, this book was even better than the last two- though, it shouldn’t have really been surprising because Eva Pohler is just so ridiculously talented that it kills me. From the moment this book started, it drove me absolutely crazy (in a good way). I was so excited to be back in this world with Therese and Than, but mainly Hip (let’s be honest). I think the character’s that Eva has created are so wonderfully written and I particularly like the way she writes each of the gods and goddesses- they are all so different, but they all work so well together. 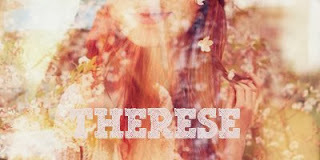 Therese is legitimately one of my favourite young adult protagonists, perhaps even my favourite character ever. I think she is definitely a character that most readers will be able to connect to in some way or another, even if you aren’t off falling in love with the God of Death. Even the characters that aren’t Gods are just perfect- I felt so sorry for Jen throughout this book and I sincerely hope that things get better for her. One of the best things about this series is the pets- Eva never fails to mention them and give them an important role in Therese’s life. It is so very amazing to read this interaction between Therese and her pets, because I think it’s definitely something that most books miss out on. Just another way in which Eva’s books are so unique! The plot of this book is as amazing as ever. It’s especially amazing how Eva always manages to slip things in from the previous books- I swear, she never leaves an important thing out of anything. The pacing of this particular was also really good- sometimes I feel like sequels often spend quite a bit of time recapping and whatnot, but this one gets right into the action. Another thing with the pacing is that it was very well done- it was pretty steady throughout the book, there weren’t those long parts where nothing really happens, instead it’s all interesting. Again, this is a pretty rare thing, but as usual Eva does it perfectly. Another thing is the world building- I can’t say I’ve read many books set in mythological settings but Eva does such an amazing job at creating these beautiful scenes and descriptions that are so easy to imagine and really do transport into this world. I think I should probably stop going on about this book, before things start to get out of control and I begin to decode absolutely every word that Eva has written (I would so go there). But the most important things are that this book is just crazy and brilliant and every other good adjective in the entire world, Eva Pohler is once again the most lovely, talented, amazing author alive and that you should most definitely read this entire series so that you can experience it for yourself. I honestly don’t think I could ever accurately express my love for this series, so please just give it a go for yourself. Eva Pohler, you have done it again. Okay, okay. 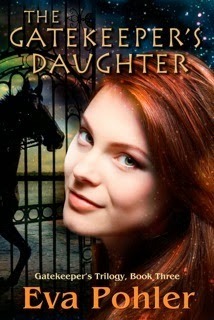 I just finished The Gatekeepers Daughter and I absolutely loved it to death. Haha- See what I did there? Ain’t I punny? Eva is crazy talented with her methods in story telling. You can’t deny she knows how to create a story and maintain it the whole way through. One of the things I loved about the previous book was how Therese never forgot about what happened to her previously and this book doesn’t take away that magic. Her character is just total and complete and she has to be one of my favorite heroines with no aspect of being annoying whatsoever. One of my favorite things about this book is how Eva was able to handle topics people don’t usually bring up in young adult fantasy books. It creates a distinct credible link between the real world and Greek world, which is meandered between in the book itself. It takes candor for someone to discuss those topics and I generally appreciated the presence of them. This was fast paced to the max. I had barely had any time to step away and breath. Every time a problem was solved another one would come up and everything would just be laced within each other and it was nuts and crazy and just WOW. If you haven’t read this series you should seriously give them a chance. They are utterly fantastic and I just want to hug them to death.